When Jimmy Montgomery celebrated his 70th birthday in November he mused on when a new generation of heroes might emerge to eclipse the class of 1973. On a night of incredible, implausible drama at Old Trafford, Vito Mannone made a creditable case to join him in the pantheon of red-and-white immortals. His save from Rafael Da Silva – low and to his right to block the Brazilian’s tame effort – might not have had the same soaring brilliance as Montgomery, but given all that had happened in the previous two hours, it will surely achieve the same iconic status in time. Sunderland are in their first major Cup final since 1992 and for the guts, the brio and bravery they showed against a paralysed Manchester United they fully merit it. That they made life tortuous for their 9,000 travelling supporters in the process will be forgotten in the joyous aftermath of this astounding evening. Credit must go to Gus Poyet, who came with a blueprint and had to re-write it several times over the course of a tumultuous night. Sunderland might have only had one shot on target – the Phil Bardsley goal that squirmed under David De Gea – but make no mistake, they made the running for a heck of a lot of this game. His substitutions were inspired, his mettle tested to the full by the challenges of adapting his gameplan in extra-time. But his players came through after the most amazing extra time you will ever see. Faced with the task of scoring to keep themselves in the game, it looked as if Sunderland’s chance had passed when their pressure failed to tell. But Bardsley’s weakly hit shot somehow found its way past De Gea. Game over? Not even close as Javier Hernandez made the most of Sunderland’s failure to concentrate in injury time. The penalties were purgatory. Only Marcos Alonso and Ki, two fine performers on the night, hit theirs with any conviction. Thanks to the heroics of Mannone, an after thought when he was signed in the summer by the discredited Roberto De Fanti, it didn’t matter. What a story this is. Sunderland have teetered on the brink of disaster so often this season but Poyet has approached his task with a hint of alchemy, turning discarded and unloved players into potential match winners. Mannone is one but Ki, who won this Cup last year, is another. Along with Fabio Borini, they were some of Sunderland’s best players on an epic night. It started so cagily. 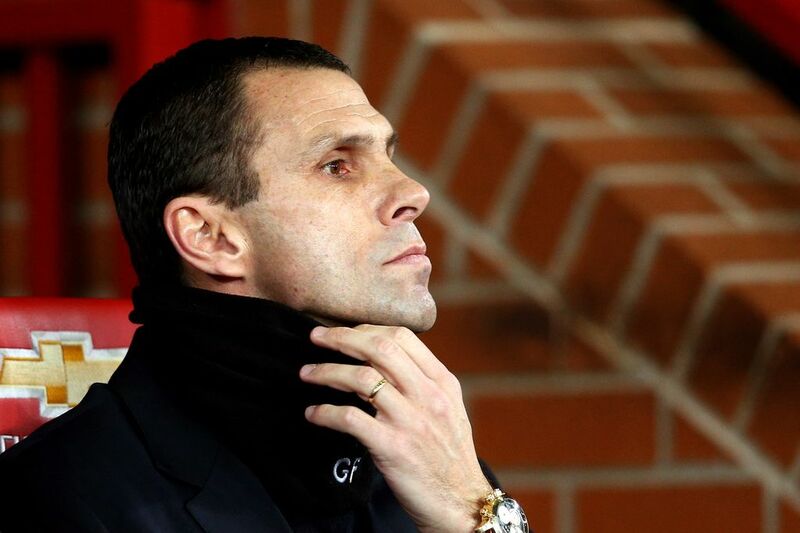 Poyet’s blueprint was clear: frustrate the home side and starve star man Januzaj of the ball. With Ki Sung-Yueng asked to act as the outlet, it was a gameplan that was playing to perfection for the visitors until the attacking flurry on half an hour that yielded Manchester United’s goal. Before then, Sunderland had made their hosts look one-paced and over-reliant on the precocious Januzaj. To be fair the wing maestro is some talent and he shrugged off a cynical clattering from Fabio Borini in the first ten minutes to make his mark as the most creative player on the pitch for the first 45 minutes. The best move before Manchester United’s opener was Sunderland’s – and it was a triumph of direct, incisive football. Adam Johnson was a largely peripheral figure as Sunderland prioritised containment but his smartly hit through ball that found Borini was brilliant, and nearly matched by the Italian’s sizzling 30-yard drive that dipped just over De Gea’s goal. Just when Old Trafford started to doubt, Sunderland’s set-piece sloppiness handed them a route back into the contest. They had been handed a warning about slack marking a minute before the goal when Darren Fletcher looped round the back of the Sunderland defence to brush a shot against Mannone’s post. Sixty seconds later they were punished for a similar breach. Whether it was luck or judgement on Danny Welbeck’s part when he hooked Shinji Kagawa’s cross into the path of Jonny Evans is unclear, but they benefited from O’Shea allowing his former team-mate free reign at the back post to divert past Mannone. It was a hammer blow for Sunderland and required a complete re-working of the strategy from the touchline. The scoreline would buy the Black Cats an extra 30 minutes but it also meant they needed a goal to keep their Wembley dream alive. Here was Poyet’s dilemma writ large: the home side’s vulnerability was obvious but another goal would have been disastrous to Sunderland’s cause. How could he satisfy Sunderland’s dual demands of frustrating Manchester United while also exploiting their emerging frailities? Poyet resisted the temptation to ditch Steven Fletcher, an ineffectual figure in the first half, and retained the same personnel as Sunderland set about their second-half assignment. And while their attacking contribution increased greatly, there was still the not-so-insignificant matter of what do about Januzaj – by far the home side’s biggest threat. The Black Cats’ response was stirring. From being largely under the cosh in the first half they proceeded to make the running as the tension cranked up around Old Trafford. It was a ringing endorsement of Poyet’s abiity to turn around a game – even if his changes couldn’t quite encourage the goal that would have given Sunderland their golden Wembley ticket. The injection of Craig Gardner – another of the Sunderland’s lost boys finding a degree of salvation under Poyet’s astute tutelage – turned the pressure back up just as the home side appeared to be getting a grip on it again. When Michael Carrick departed with a foot injury which looked particularly nasty, it was all Sunderland. They were running the midfield and making all of the game’s best chances. Indeed the home side’s best opportunities came as Sunderland went in desperate search of the goal that would keep them in the competition in extra time. Javier Hernandez, who barely made an impact, raced on to a Januzaj throughball but had neither the conviction nor the pace to add the finishing flourish that would have put the game beyond the visitors. And Januzaj betrayed his inexperience when he snatched at an opportunity – before the incredible drama of extra-time unfolded.